After surviving a series of traumatic events, Maggie O’Bannen is at last starting to heal and the scars of the past are fading. Not to mention that things with her close friend Doc John Simpkins could be about to get interesting. However, the depiction of her exploits in a series of dime novels mean her reputation reaches far and wide and when a couple of down on their luck gunmen believe what they read, they hatch a plan to make Maggie their quarry in a deadly hunt. A bungled bank robbery, a kidnapping and the arrival of an old friend bearing bad news are only the beginning as Maggie is drawn into a fight for her life. Armed with a short temper, outlaw Frank O’Bannen’s Schofield and the resolve to use both, she refuses to let anyone stand in her way. Outnumbered and outgunned, she might be. What her enemies don’t realize, is that her biggest weakness is also her greatest strength and when there’s nowhere to run, they’ll be the ones looking for a place to hide. 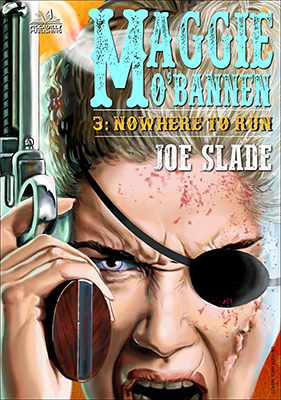 The third Maggie O’Bannen tale offers everything we’ve come to expect from the previous two stories; strong characterization, a very fast-moving plot, plenty of hard-hitting violence that is fairly graphic in its depiction and a number of twists. As Maggie’s relationship with Doc Simpkins gets stronger, she discovers she’s about to become the prey in a scheme to make a couple of people rich. This is a neat plot that becomes further complicated by the reason one of the hunters has entered the game. Not only does this particular person make for an interesting character then so does Lorelei who makes for a great addition to the cast. Joe Slade, a pseudonym for Joanne Walpole, has come up with another hard-to-put-down read that will satisfy everyone who likes their westerns action-packed. The ending offers a further surprise that could well be setting up the plot for the next book and for me and the many fans of Maggie O’Bannen I hope we don’t have to wait too long to find out. Available to pre-order now, this title will be released on October 1st.